The giant lights that illuminate the falls each evening year round are located in Queen Victoria Park on an old building that locals call The Illumination Tower. Actually, this structure was at one time part of the Ontario Power Generating Station that was built in 1906 at the foot of the cliff directly opposite the tower. It also served as an observation building for many years. The round circular building which is part of the building is a surge tank. When too much water, from above the falls, passed through penstocks to the power station below the water needed a place to back up into. That place was the surge tank. The power plant has been out of service for many years. Now, the surge tank sits empty. 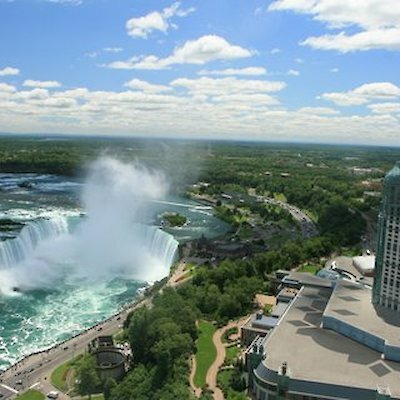 Take a look at a few photos I took from atop the Skylon and you’ll see what I mean. Thank you! 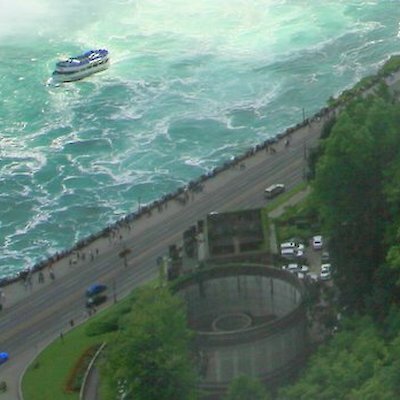 After seeing this from the Skylon today I was on a quest to figure out what it was.